Kate Mack is a long-standing brand that continues to gain new followers with every collection. Biscotti is known for their elegant dresses while Kate Mack is the fun-loving sister. She is here to boast of great style, especially to the beach or pool. Let�s take a quick look at the things that make Kate Mack the fabulous brand that she is. One of our favorite go to�s for swimwear, Kate Mack is sure to have a girls swimsuit that your daughter will love. Sizes that include infant swimsuits up to styles for tweens, a perk of Kate Mack is easy coordinating for family vacations. Every swimsuit is designed with such care, from the bold, popping colors to small details. 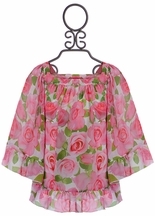 A favorite trim, many of Kate Mack�s swimsuits will find sweet fabric flowers near a hem or neckline. These added accents are created with the same water safe fabric. Separate lines from the Kate Mack releases hold patterns, colors and looks all their own. Within each line you will find not only a variety of suits, but also matching girls swimsuit coverups. Does your daughter prefer a one-piece suit, tankini, bikini? Kate Mack has styles for every girl! 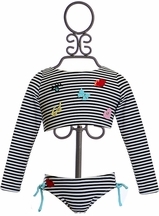 Their girls two-piece swimsuits are created with the same great quality fabrics and attention to detail. From a touch of tulle skirting to quaint bows, you can be sure that each peace was designed with love. Customers comment on the exceptional quality with the purchase of any piece from Kate Mack. They comment on the one-of-a-kind pieces and how much their daughters love their swimsuits. Only a brand that sets such high standards for both lasting designs and modern, on-trend looks will receive the amount of love that Kate Mack swimwear has and does in every season. The great news is that this elegant, fun and slightly whimsical brand doesn�t just stop at swimwear. Kate Mack is also known for their elegant girls skirt sets and dresses. These designs often feature a touch of sparkle and a hint of French influence. She will feel as pretty as can be when she wears a Kate Mack outfit to birthday parties, school photo days, holidays or really any day of the week. The skirts are often built with tulle and ruffles while the matching tops are accented with sparkling details and/or cute screen prints. Summer fun by the pool and at the beach in girls swimsuits by Kate Mack. 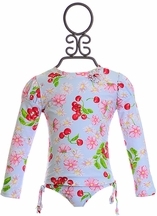 Add the matching girls swimwear coverup to complete the look. Bright colors to trendy leopard prints. While Kate Mack is know for its swimwear, they also offer a stunning fall and winter collection perfect for any occasion. Perfect pant sets to special occasion dresses.